A SIGNIFICANT HEAT EVENT IS FORECAST TO DEVELOP BY WEDNESDAY AFTERNOON WITH RECORD OR NEAR RECORD BREAKING HEAT POSSIBLE FOR THE URBAN AREAS OF THE GREATER SAN FRANCISCO BAY REGION. AFTERNOON HIGHS ON WEDNESDAY ARE FORECAST TO REACH THE MID 80S TO MID 90S AND THEN WARM TO THE UPPER 80S TO NEAR 103 ON THURSDAY WITH RECORD TEMPERATURES POSSIBLE. …………………… ALSO…NEVER LEAVE CHILDREN…ELDERLY OR PETS UNATTENDED IN ENCLOSED VEHICLES…EVEN FOR A SHORT TIME. TEMPERATURES QUICKLY RISE TO LIFE-THREATENING LEVELS EVEN WHEN THE WINDOWS ARE PARTIALLY OPENED. Seriously people, don’t be complete schmucks and leave anything that can’t tolerate heat in the range of 150 degrees fahrenheit in your car. Better yet, don’t drive. Looks like the weather is going to be spectacular for a walk. in San Jose. Lo, I found a few handicapped parking spaces out back of the building where I teach, but it was up a very steep hill, in a sort of back alley with no sidewalk connecting it to campus. Out in the main parking lot, there was a big area of disabled parking spots, so I went for that. 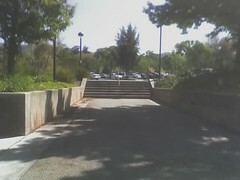 Then I had three choices: Head to the center of campus. Head into what looked like a big complicated indoor/outdoor building maze. Head down a sidewalk that went in the direction of my building! Our sister city now has a Metblog! Joann my dear, we’ll miss you greatly. But I’m happy to announce that we have just launched our 53rd, yes you heard that right, fifty freakin third city blog. San Jose is in da hizzy biatches! We are also looking for San Jose bloggers to join the team so if you’re interested in writing about your town then let us know! Posted in San Jose | Comments Off on Our sister city now has a Metblog! A. The SB liberal hasn’t gotten his job back, because things are really going downhill. The SB libertarian has been back at a similar job, but this time with no company cafeteria, for a year, because things are really picking up. I was just chatting with another SF Metblogger who had missed the fact that in the comments of the medieval warming post, Joann had said she’s leaving the blog as a writer. I checked, and she’s deleted most of her posts too. I respect the fact that Joann hasn’t appreciated the last few rounds of the game “pick on the republican”, and I say goodbye, and that I’ll miss her!